A protein diet plan can be beneficial for women in many ways. Apart from aiding weight loss, the diet also helps deal with several health issues. Eating quality proteins at every meal can help women with a weak digestive system, and with ample amount of physical activities on their daily schedule a protein diet can also reduce the risk of developing osteoporosis. However, sticking on to a protein diet can be a tough task and can sometimes lead to deficiencies in the body. Hence, it’s all right to go on a high protein diet as long as you’re able to keep a healthy balance in the nutrition you consume. Below you will find four popular protein diets that work for women. For women, the primary advantage of this diet is weight loss. It allows 20 to 90 grams of carbs per meal and encourages the consumption of legumes and beans, whole grains, vegetables, unsaturated fats such as olive oil and fats from nuts and fish, and low-fat dairy products. The South Beach Diet has given better results when it comes to weight loss, as compared to the low-fat and high-carb diets. It also helps improve the cholesterol levels because it is high in healthy unsaturated fats and very low in carbs. This diet does not require planning meals, nor does it have a set plan for different meals of the day. You’re allowed to pick foods you like from your local store (as long as they’re allowed in the diet). In addition, there is no fat or calorie counting on this diet. The atkins diet is 27% protein, 5% carbs and 68% fat. 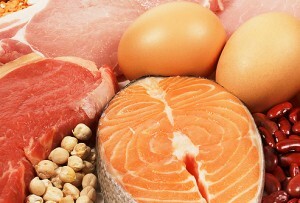 It allows all types of fat and protein, such as fish, meat, poultry, eggs, butter, cheese and oil. However, it does not encourage consuming bread, fruits, pasta, milk, starchy vegetables (such as corn, peas and potatoes), and alcohol. The atkins diet is one of the best protein diets for women as it not only helps in losing weight but also helps in weight maintenance. It may help prevent diseases like diabetes due to low carbohydrate content and in turn, producing insulin. The diet is known to be more filling and satisfying and has also reduced cravings for junk food in many women.